AnonD-462451, 09 Nov 2015Looking to purchase this active phone, one question though, are the physical buttons below the... moreNo they don't, they are a silent soft touch button. I didn't like them at first but they prove themselves underwater and have grown on me. Looking to purchase this active phone, one question though, are the physical buttons below the screen "loud"? As in do they "click" or "pop" when pressed? (Not through the speaker, etc, but actual noise. Thank in advance. I love the phone, had it underwater and worked great! Videos are excellent underwater! I've been using it for a year and still no regrets! What's wrong with Samsung. S4 is already great! Use the same phone with better waterproof and shockproof case. Expand the battery. Add wireless charge. Put on this phone some extra adventurous characteristic. Make the camera better, not downgraded to 8Mp. Or use the same! Why are you making this phone with Gorilla Glass 2 and why are you subtract thermometer & hygroscope? I mean we are the explorers and sporters so this is Galaxy Active!? Does this phone allow you to see emojis someone please help!!!!!!!!! AnonD-165798, 16 Jul 2013galaxy s4 active claims of waterproof or being able to use for underwater picturs are bunk. o... moreI bought SA S4 and it's good that i didn't put it in water...YET! AnonD-165798, 16 Jul 2013galaxy s4 active claims of waterproof or being able to use for underwater picturs are bunk. o... moreLMFAO!!!!!! Hi, my s4 active have not the option for slow motion in the camera app like the s4 before. can u pls tell me where i have to find it? blowerz, 16 Jul 2013Any idea when the Active will be available on EE anyone?The Samsung S4 Active is already released to all network providers so avaliability should be fine. Any idea when the Active will be available on EE anyone? Waw,samsung is my favourite mobile company i love it,at this time samsung galaxy s3 in my use. 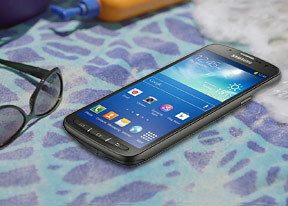 It is the most important thing like dust proof and water proof and brilliant design of S4 active. This review is great! Im sold, and now truly excited about my active coming in soon.